She's bringing a couple of sharp friends. 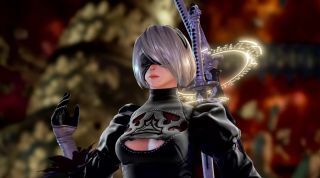 2B, Nier: Automata’s moody android, will be joining the Soulcalibur 6 roster next week, Bandai Namco announced on Twitter. You’ll be able to stoically batter your opponents from December 18. It looks like 2B will fight a lot like she does in Nier, down to her crazy aerial attacks and special moves. Her pod will lend a hand, too, firing at 2B’s enemies. It all looks pretty spot on. You can see her in action in the trailer below. Soulcalibur is all about its fancy weapons, and 2B has plenty, though only Virtuous Contract and Virtuous Treaty have made their way over to the fighting game. They’re normally used to carve through hordes of machines, but I’m sure they’ll be able to handle her Soulcalibur opponents. 2B also comes with an extra outfit, a new stage—City Ruins—and extra items for Soulcalibur’s wild character editor. If you’ve got the season pass, you’ll get 2B automatically, but since the previous DLC character, Tira, was also sold separately, expect the same to happen here.